When you sign up for the “Blue Whale Challenge,” you are given a series of tasks over a period of 50 days. One day you could be told to watch a scary movie at 4:20am, while on another you might be required to cut yourself. On the 50th day though, to win the challenge, you must commit suicide. These are the stories circulating ever more frequently over the last several weeks here in the U.S. The truth about this mysterious Blue Whale, however, is harder to pin down. We were first alerted to the Blue Whale Challenge—also known as the “Blue Whale Game” or “Blue Whale App” (though no such app exists in the app store)—in February. The term “Blue Whale” reportedly comes from the practice of some whales beaching themselves, thereby ending their lives. The buzz had already been circulating abroad for many months before we’d heard about it. It appears that discussion of a Blue Whale Challenge began in Russia around May of 2016. There were reports emerging that dozens of primarily Russian youth had committed suicide as a result of participating in the challenge. As word began to spread to the States this spring, a number of school districts sent messages to parents warning them of the challenge. But there’s a twist: not a single suicide (nor any harm whatsoever) has been confirmed to be linked to the challenge. Most of the original reports about the Blue Whale came from Russian news sources or other international tabloids that have been widely discredited. Online fact-checker Snopes has been unable to verify any specific claim related to the challenge or its participants. A 21-year-old Russian man is apparently in custody in St. Petersburg for his role in inciting suicide online, but whether he really started the challenge or was inspired by the international hype is anyone’s guess. Collier rightly concluded that this is a good opportunity for parents to talk with their children about media literacy generally and “fake news” in particular. The Internet is rife with information: some good, some bad, but all should be consumed with a critical eye. My concern about the sudden captivation in the Blue Whale centers on hackers who will capitalize on interest in the activity to lure curious clickers into compromising their computers and networks. And even though there has yet to be any confirmed suicide directly connected to the game, it could lead to trouble for vulnerable youth looking for attention. A suicide contagion has been well-documented in research and so even just increased discussion of suicide in relation to this game is potentially problematic. 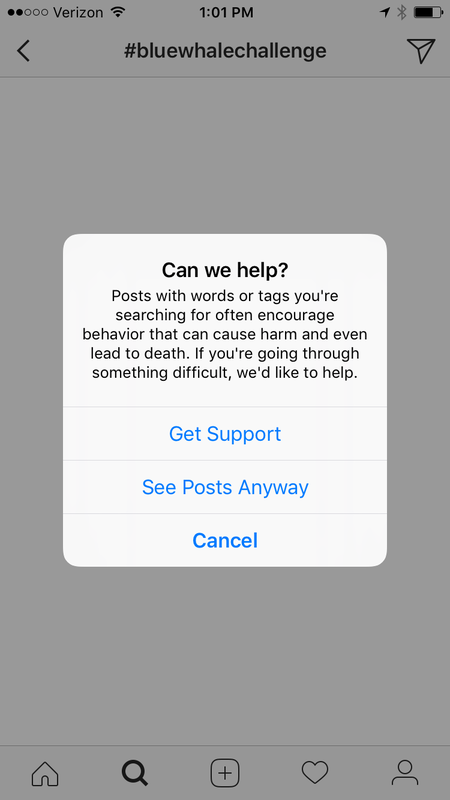 Instagram now warns users who search the app for #bluewhalechallenge that they may encounter images that encourage hurtful behavior. Whether the Blue Whale Challenge/Game/App is true or not is mostly beside the point. 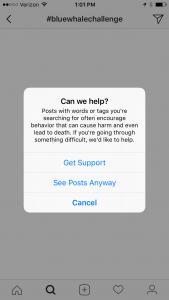 There certainly are many pro-suicide websites and individuals or groups online who encourage others to commit suicide. Today it may be a Blue Whale, tomorrow it could be some other high profile provocation. Take this opportunity to talk with your children about what they might encounter online (positive and negative) and foster a relationship with them so that they know they can turn to you if they run into trouble or are feeling down. Frequent and open dialog is the best way to inoculate our kids from the variety of life challenges they are likely to confront, whether perceived or actual, online or off. I&apos;m not quite sure one can say the blue whale challenge is fake. In Italy, on a mainstream TV programme Le Iene, interview with the Russian families with videos of the actual suicide shots was aired. I doubt that was faked. Please check all your sources. Thanks for the comment. I am very comfortable in my assessment that the Blue Whale Challenge was fake (and the media commentary about it still lacks verifiable substantiation). I have not seen any confirmation of any harm directly resulting from participation in this game. That doesn&apos;t mean that parents aren&apos;t going to think their child has participated. It also doesn&apos;t mean that teens are not vulnerable to copycats or other online suicide encouragement (which do exist). I have not researched the specific family you are referring to, but all of the reports I have looked into were later discredited. If you have access to evidence to the contrary (particularly forensic evidence from the phones of possible victims) I would love to see it so I can update the post. Thanks again for reading. They believe a teenager in Queen Creek, AZ just ended his life due to this ridiculous game. Many signs of the game are apparent!! Hi Sarah – I still have not seen any validated evidence of participation in this activity causing a suicide. What needs to happen is the police need to forensically analyze the devices of these young people who committed suicide to see who they were communicating with online. The evidence of blue whale, if true, would be obvious. In all media accounts the link to blue whale is complete speculation. That is not to say that it will not influence people to suicide. It is dangerous, even if made up. Thanks for visiting our blog and for taking the time to comment. WHAT FAKE ! no fake here , just read the algerian newspaper, they mentioned that a 15 year old and an 18 year old commited suicide by hanging following the 50 days game and challenges of the &apos;blue whale challenge&apos; they were following… check this article… the whole village/parents/school children are in shock . just reality ! Why would you start something so stupid that can cause harm to our children . They think it is a harmless game! THIS SHOULD BE TAKEN DOWN! Did you read the post? We attempt to clarify the facts regarding this "game." We believe parents need accurate information so they can inform their children. Most of what is posted online about Blue Whale is inaccurate. These inaccuracies surely do have the potential to harm children. Unfortunately, this article is incorrect. I personally know of 2 suicides and 1 failed attempt in Michigan. I have Social Worker friends volunteering their time this weekend to provide counseling for family, friends, and schoolmates of these affected teens. Please provide evidence of your claim. Yes, there are too many teen suicides, but I am still unaware of any that has been directly linked to participating in this game. If you can link to a police report or even a bona fine reliable media report with details that show a teen participated in this game (digital forensic information, screen shots from the handler, etc), that would help move the discussion forward. We hear what you are saying, Jamie. That said, we have yet to see any evidence from law enforcement, a legal expert, medical professionals, etc., that the suicide was directly and solely tied to the Challenge. I’m grateful to your social worker friends who are helping others.